This past summer my grandmother, Marjorie B. Johnson, passed away. She was the wife of Donald G. Johnson, my grandfather and the subject of my film “16 Photographs At Ohrdruf.” Marj appears in the film, and in my quest to find Don’s “lost” photographs I had to convince her to give them to me. One of the most powerful moments in the story (for me, anyway) is when she takes them out and we go through them together. My hands were shaking the whole time and it was, I think, a very important moment for my family. This summer, we were all in Vermont for her funeral. Her passing was tough on all of us and my mom Ruth (who also appears in the film) stayed with her until the end. My uncle Grant and his wife Paula were also there, making the trek from Missouri. Marj passed away in the same living room where Don passed, almost 22 years later. A photo of my grandmother’s bureau. The picture on the right is my grandfather Don from WWII. One of the weird things about funerals is how they bring families together. I hadn’t seen my uncle in a long time, and I’d almost lost touch with my cousin. It was great to catch up with them and make new memories. Perhaps because of this newfound family unity, we all seemed really reluctant to “claim” the bits of furniture and nostalgia around the house. Some items, like Don’s military funeral flag, were coveted by everyone. Other items like mugs and books and furniture had value to some but not others. Anyway, all this is a long intro to the fact that I was allowed to take a few WWII era objects from the glass case in the living room. 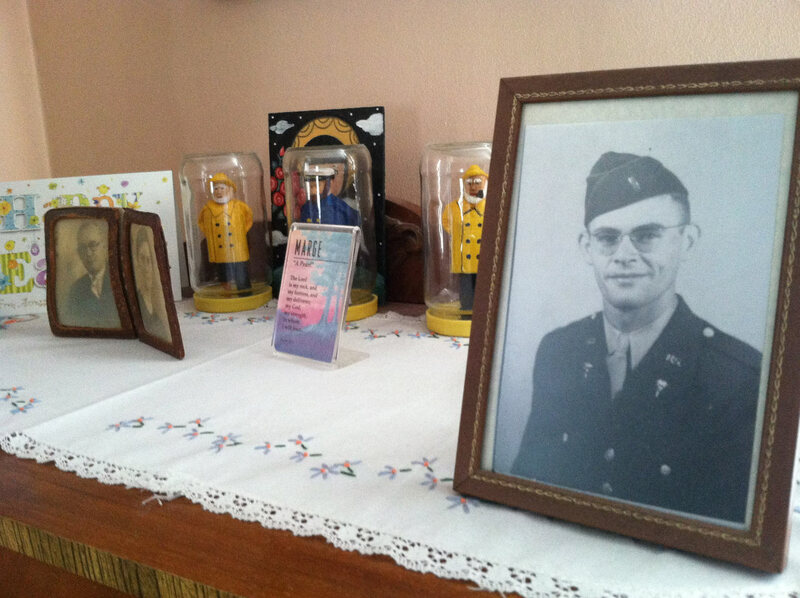 Don’s WWII medals were gone, probably donated by Marj to the local historical society. As her memory faded she purged many things from Don’s past. Even if they were around, I doubt I’d have been able to keep them. But I was able to take some other things like pins, some spent WWII artillery shells, and a small brown packet. It wasn’t until today that I finally opened up the unassuming rectangular box that I’ve had in storage since the summer. A little time poking around the internet made my eyes grow wide. 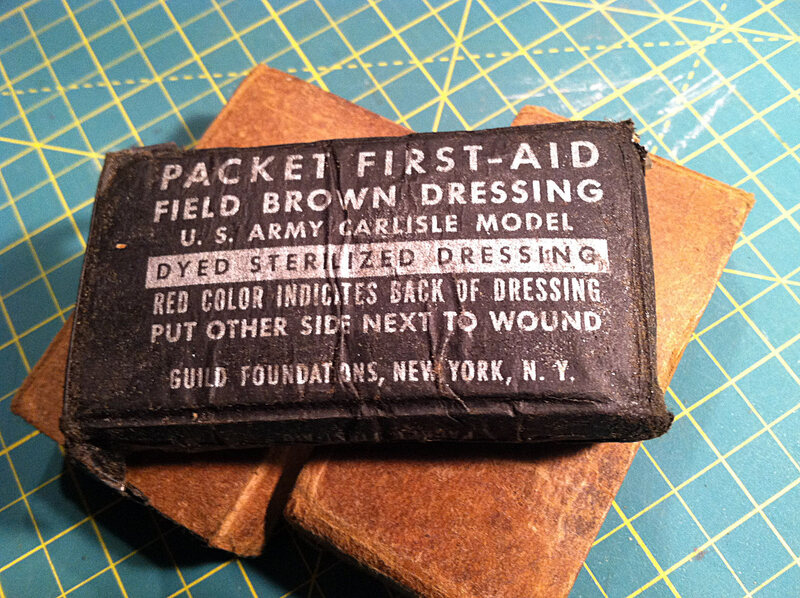 During WWII Don was a medic, and I’ve written a lot about where he went and what he saw. But holding this box suddenly made it all real for me in a new way. This little packet is a First-Aid packet carried by soldiers during the war! Somehow, my grandfather kept a military medic’s field dressing alongside his medals and pins and awards for all these years. He passed away in 1991 and we all just looked past it all this time. But now, as I hold it, I feel the weight of all the history contained in this crumpled, brown cardboard box. I’ve worn authentic WWII helmets and I own a collection of division patches, and I’ve even held (but not fired) a captured Nazi Luger. Yet somehow holding this packet brings the story of the war home in a whole new way. This memento is not about taking life, or seeking glory… it is about saving life in a time and place where violence was commonplace. This is an object prized by a man who didn’t want to kill, but to heal. This is an object representative of a life spent as a medic in the war, and serving on the ambulance corps and rescue squad for all his adult life. 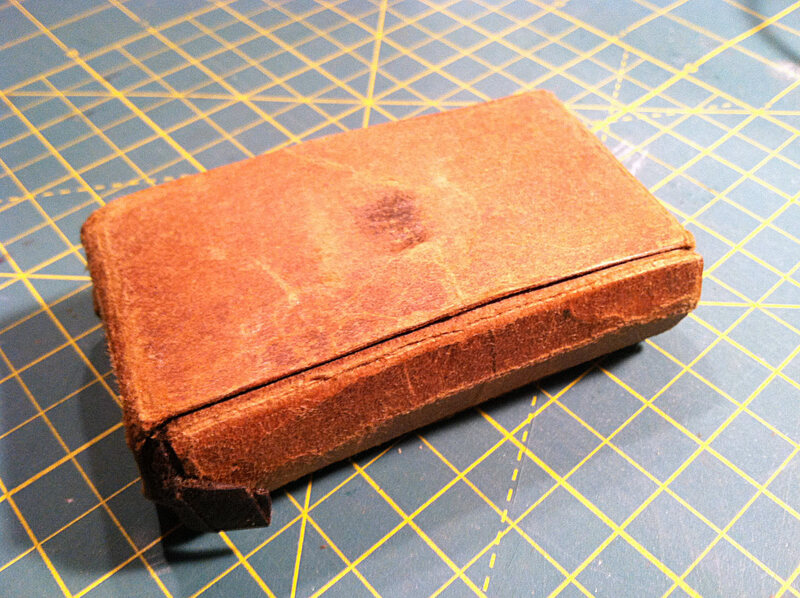 This is a box that tells a story of WWII shaping a man’s future that is hopeful, optimistic, and dedicated to service. So I’m glad I found this packet. It tells me more about Don than I ever knew, because it tells me that his time at war was truly what I’ve always believed it to be: a time that shaped him as a person who wanted to help people and make lives better. It was nice to be reminded of that.